Pulunkari means vegetables in puli (tamarind). Unlike a lot of the Kerala dishes, this is one that does not use coconut. Tradionally it is made with pumpkin. Another version made with a variety of mixed vegetables like Arbi (Colocasia), Drumstick, Ash Gourd, Brinjal etc is just like sambhar but without the sambhar masala. This recipe uses Papaya as the main ingredient. Use slightly ripe papaya to get the best results. Pressure cook Tur Dal with turmeric powder. 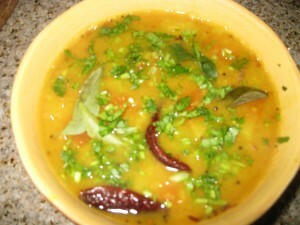 To the cooked dal add Papaya pieces, green chillis, and red chilli powder. Cook till the papayas are done. Add the tamrind paste diluted in water. Add salt. Cook till done. For tempering, Heat oil, add mustard seeds. When the mustard seeds begin to splutter add the fenugreek seeds, red chillis, chopped shallot, asofetida and curry leaves. When the shallots have turned brown; turn off the heat; add the tempering mixture to the cooked dal. Tip: Soak Dal in water for ½ hour to reduce the cooking time.